(Drumroll, please). Not to be outdone by the Oscar nominations, we too have our tops list to roll out. These are the top three questions most often asked about mice. Number 3: How did they get into my home? Great question. It combines a couple of myths that we’ve talked about in earlier blogs. The answer? They come in through an opening just like any other thing that enters your home. Think about it, a door is a hole, just like there may be a hole near a faucet pipe, or the dryer vent, or the tiny crack under the garage door. The reality is that mice need only one-quarter of an inch to enter your home – that’s pretty small. No, no, they do not have flexible bones and cannot flatten their bodies out as some like to tell us, their skulls are simply one-quarter of an inch at the widest spot. Wherever they can fit their head, they understand that they can pull the rest of their body through. Why do they come in? Well, it’s cold out. Would you want to spend the winter outside in the cruddy weather we experience in New England? Much like we need warmth, food, and water, so too do the mice, and they are seeking those things when they enter your house. Number 2: It’s only one mouse, why do I need to sign up for a whole year of service? Ahh, innocence at it’s best. 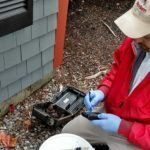 There are many things to say regarding why pest control is a year round battle and why keeping pest control services, even when things seem great, is still necessary. But that’s a topic for another day. The reality is, it’s never one cute little mouse that is harmless. Chances are, it has a mate tucked in some cozy warm spot in your house, and together they have more mice, and those mice become mature enough to do the same. Every six weeks in fact. So barring that no other mice enter from the outside, like the first ones did, just a couple of mice can quickly turn into an infestation. 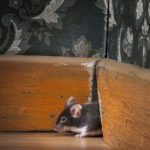 Will the mice die in my home? This question goes hand in hand with one of the most popular myths that pest professionals hear. Which is, “mice eat the bait and go outside to find water and die.” Supposing that the bait makes them thirsty? So let’s tackle that first. If the bait causes some thirst, part of the reason they take up residence in your home is they have found the necessary things to survive, including water. So should the dying thirst be true, they wouldn’t need to go outside to find water. So the answer to the number 1 question is…maybe, possibly, likely. They live in your home; they continue to go about their business not knowing that what they just ingested will eventually be their demise; so they very possibly could die in your home. Wherever they nest, wherever their travels bring them, they could just keel over. Sometimes in places that they are seen and accessible, sometimes in places we know they are hiding but cannot reach. Eww, I’ll have dead mice stinking my place up? Well, for a few days there may be an odor, but we also have a solution for that as well. The alternative? Let mice continue to invade your house potentially spreading disease to your loved ones. A sobering thought, but the only other possibility when dealing with mice. So there you have it, our top three questions regarding mice. If you have a pest (or mouse) problem, don’t try to tackle it alone. Give Modern Pest Services a call today at 1-888-997-3312 or get an instant online quote for the comprehensive HomeCare Green program that controls 60 common pests, year-round – including mice!